You may wish to see an introductory page to this section or a page on Avignon first. On reaching the platform of bare rock of Rocher des Doms (..) the traveller will find himself on the brink of a precipice looking over the Rhone here divided by an island towards the towers of Villeneuve which was long a frontier fortress of France on the opposite bank. (..) The tower which formed the Tete du Pont of the broken bridge of St Benazet faced with stones cut in diamond facettes built by Philippe le Bel merit notice. At every step we advanced as we descended the hill, new beauties of prospect displayed themselves, till at last we reached the banks of the Rhone, where a venerable old tower nods over the most rapid of currents. Here once was fixed the extremity of the bridge of Avignon, begun in the year 1177 at the solicitation of Benezet, a young shepherd, who pretended a mission from heaven for collecting alms towards building a bridge across the Rhone. In the XIIIth century the River Rhône marked the border between the Kingdom of France and the County of Provence which was a fiefdom of the Holy Roman Empire, although almost totally independent. King Philip the Fair built a strong tower on his side of the river in 1302, before Avignon became the residence of the Popes. In ca 1350 King John II strengthened the French defences by building Fort Saint-André, a state-of-the-art fortress, which was named after an existing Benedictine abbey, on a hill north of the bridge. In 1293 King Philip the Fair founded a new town (hence the name Villeneuve) on the site of a small village belonging to the Abbey of Saint-André. 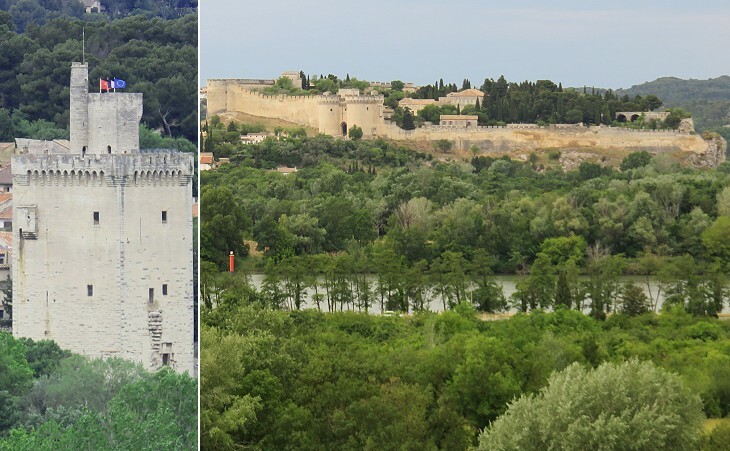 Villeneuve became almost a detached neighbourhood of Avignon after the Popes moved their residence there in 1316 and even more after they bought Avignon in 1348. 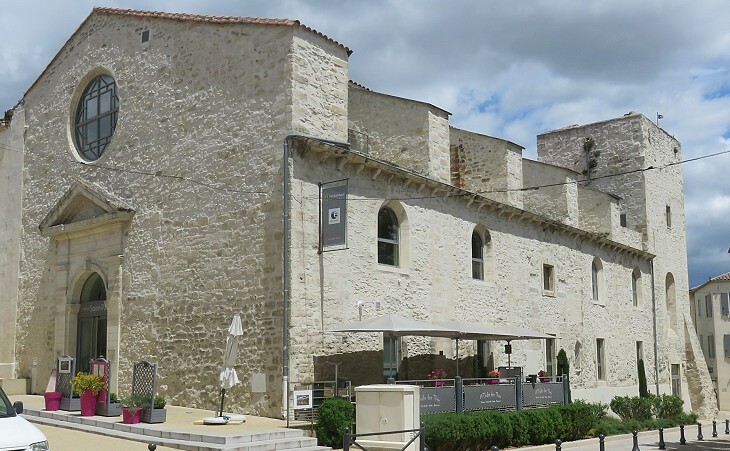 Saint-Pons was built during the early phase of the development of Villeneuve and it was its parish church until 1792. Its design shows that it was conceived also as a retreat and defensive position for the population. 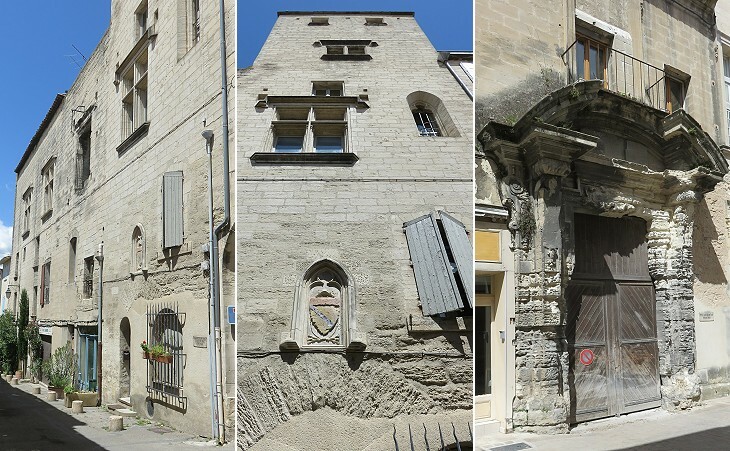 Occasionally the Papal Court premises were a dangerous place, both in Rome and Avignon. In 1317 Cardinal Jacques de Via was poisoned in the context of a plot against Pope John XXII, his uncle. Cardinal Arnaud de Via, his brother, chose to have a second residence at Villeneuve where he eventually built a large church in 1333. 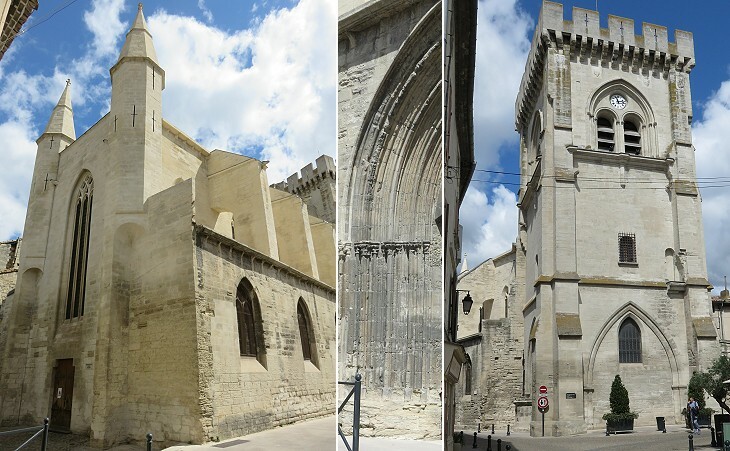 It was completed in 1350 by the construction of a huge bell tower. In 1834 Prosper Mérimée (1803-1870), a French writer who at the time was Inspector-General of Historical Monuments, a position created in 1831, visited the church and noticed a fine XVth century painting portraying a Pietà (it opens in another window) which he attributed to Giovanni Bellini, a Venetian painter. 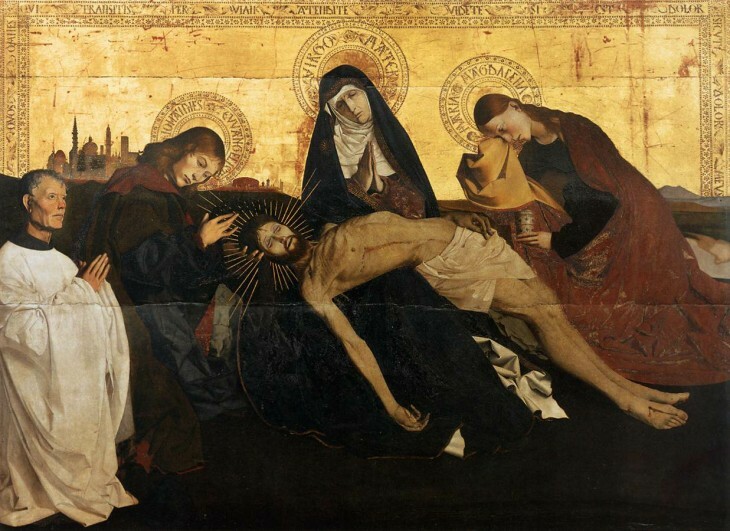 In 1905 it was bought by the Friends of the Louvre Museum and in 1959 its author was identified as Enguerrand Quarton, a painter from Northern France who died at Avignon in 1466. 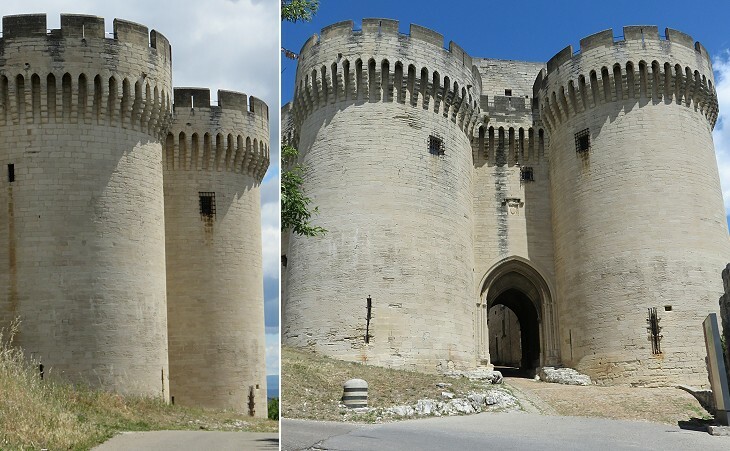 Livrées (delivered) is the name given to some palaces of Avignon because they were assigned by the Popes to cardinals and other members of the court. 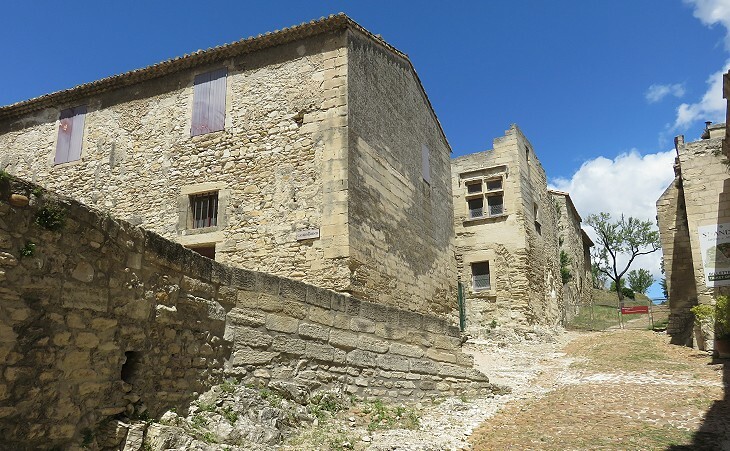 It should not apply to the palaces of Villeneuve because the town was not a Papal possession, but it is commonly used. Cardinal Bertrand de Pouget was another nephew of Pope John XXII. The Princes of Conti were a cadet branch of the Bourbon royal family. Armand I de Bourbon, Prince de Conti, was governor of Languedoc, the historical region of France bordering on Provence, in 1657-1666. In the little borough of Villeneuve the other side of the bridge, there is a handsome convent of Carthusians, whose church is much admired for its paintings. 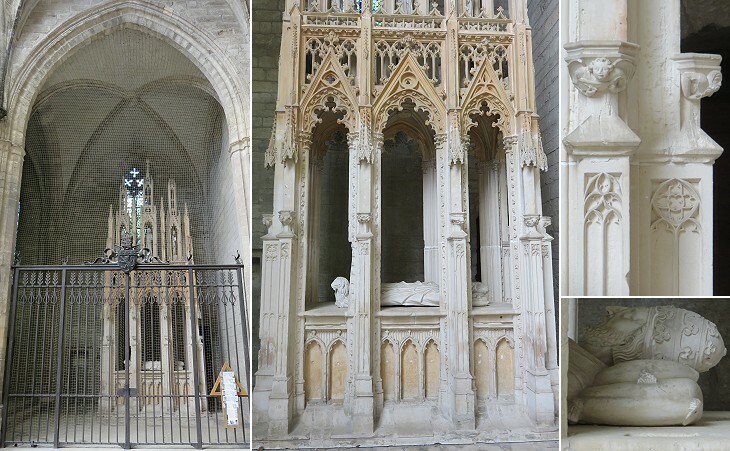 In 1352 Cardinal Etienne Aubert became Pope Innocent VI and he donated his estate at Villeneuve to the Carthusian Order; in 1356 the first monastery was established and in 1372 the main facilities were completed by Cardinal Pierre de Monteruc, nephew of the Pope. A number of donations provided the institution with a large revenue. In 1793 the complex was parcelled and sold; the church was left to rot until it was bought by the French government in 1909. 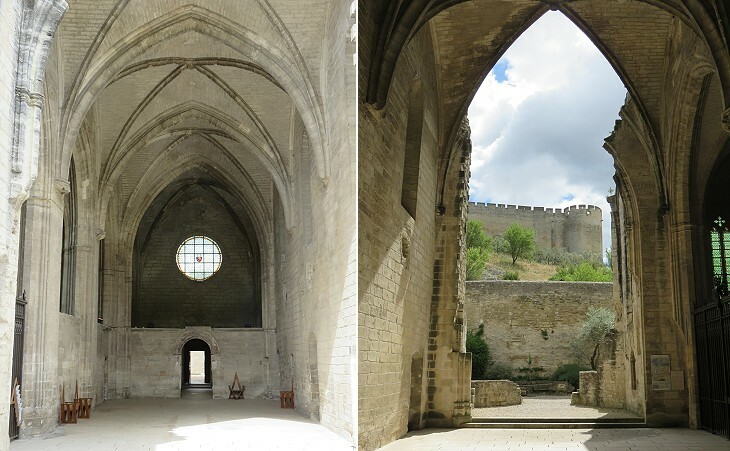 In 1948 parts of the monastery were opened to the public and eventually most of the complex was restored. The image shown in the background of this page shows a rosette, a decorative motif which was widely employed in the church. In 1959 the monument was moved back to the church. It was most likely decorated with a coat of arms of the Pope, but during the French Revolution all papal symbols were destroyed. While wandering in Madrid I came across a large modern coat of arms of Pope Innocent VI. In 1358 he granted indulgences to those who contributed to the construction of a church of Madrid, at the time an obscure small town. The church was dedicated to Saint Genesius of Arles; in recent years it was significantly restored and a coat of arms was placed on the external wall in recognition of the Pope's role in the foundation of the building. 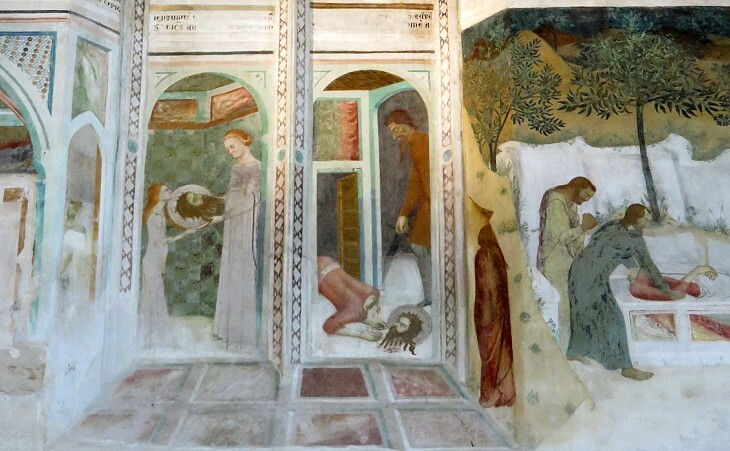 Prosper Mérimée acted also to preserve the remaining evidence of the frescoes which embellished a chapel adjoining the refectory of the monastery. They are attributed to Matteo Giovannetti, an Italian painter from Viterbo who participated in the decoration of the Papal Palace of Avignon. The fortress is very large, but its monumental aspect (Château Royal) is limited to the entrance and to a section of the southern walls. It incorporates the ruins of the Abbey by the same name and it housed a garrison until 1793.